Yes, yes. Seven-hundred-seven horsepower, 650 lb-ft of torque. It's all very impressive. But just as impressive is how that power gets to the rear wheels. 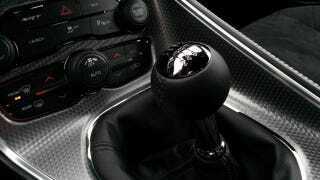 Goldberg and I drove the manual version out to the track, and the six-speed felt oddly familiar. There's a reason for that. SRT's engineers pilfered the parts bin for the manual, using the Viper's Tremec gearbox and fitting it with a new bell housing. It's slick and smooth and has just the right amount of notchiness. And the clutch is stupidly light for something with this much power. The 8-speed automatic is just as solid and makes a pretty compelling case for itself. No matter which Challenger you get, the ZF auto box comes along for the ride. But the Hellcat gets a new set of gears that are both wider and stronger, lengthening the housing. But honestly, if you're buying something with apocalyptic power, you want a manly manual to act as the hand of God.